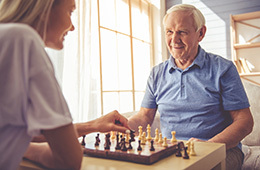 As the premier skilled nursing facility in Anaheim, California, West Anaheim Extended Care provides compassionate and personal skilled care 24 hours a day. We specialize in providing rehabilitation services onsite to help our residents regain their independence and return to their homes. West Anaheim Extended Care is a privately owned skilled nursing facility that has been under the same management since 1992. Through our experienced and long-tenured staff, we are able to provide the highest quality of care in a loving environment. Over 35% of our staff has been with us for over 10 years, with more than 70% over 5 years. Our residents and patients come to us from all areas of California based on our reputation for excellence. “Cure when possible, and comfort always” is our pledge and promise. At West Anaheim Extended Care our services and attention to detail are what sets us apart. We are happy to have outpatient therapy services available so that our patients can receive continuity of care with the same therapists from the time they are admitted to our facility, and can continue coming back for follow up care with the same therapy team. With a full-time Registered Dietitian on staff, we offer a tasty select menu, offering our residents several choices for their meals. We invite you to visit West Anaheim Extended Care today, call to schedule a tour or stop by our facility.